Ever since San Diego Comic Con, J.J. Abrams, director of the upcoming Star Wars film, and Zack Snyder, director of the upcoming Batman VS Superman film, have been constantly joking with each other via social media through various mash-up picture, including Superman actor, Henry Cavill, in Sith uniform, to C-3PO in a Batman outfit, to a Stormtrooper "stealing" the batmobile, and many more, with each director trying to out-do the other. 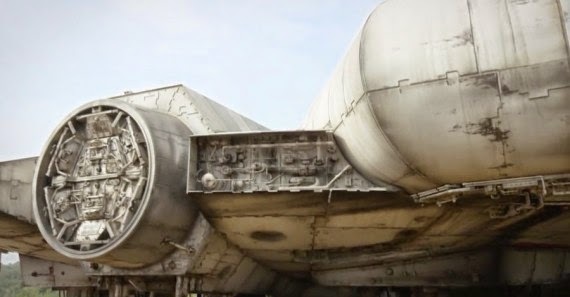 However, Abrams has brought the game to a whole new level- this time, "officially" revealing a close-up of the Millennium Falcon to be used in Star Wars: Episode VII. Simply showing off the fancy new ship isn't enough for Abrams, because it appears the Falcon has picked up a stow-away. After this incredible reveal, fans seem to have only three words to say: Your move, Snyder. Star Wars Episode VII comes out December 18, 2015 and Batman VS Superman comes out March 25, 2016.